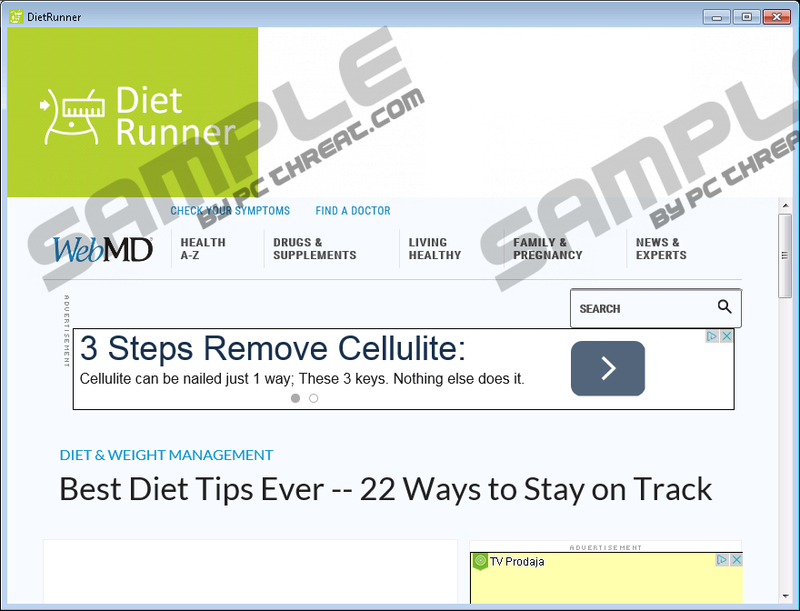 Despite the title DietRunner, the program does not display anything that is related to weight loss or diets once you download it. Mainly, it shows various ads provided by the software’s partners, and if you click on them, you may be redirected to third-party websites. These sites have their Privacy Policies that may gather not only anonymous user data, but also personal information about you. Therefore, there is a risk that your privacy could be violated, and you might not be able to control the usage of this information. If you want to keep your private data confidential, you should avoid any suspicious programs or websites that may gather and share it with anyone they choose to. You could read more about the application or slide below the text where the removal instructions are available if you want to delete it immediately. Some users may have downloaded the application while visiting its official website, but it is a small chance because for that you would have to know the exact program title. Our researchers learned that two other possibilities are more believable in this case. For instance, it may be so that there is a browser hijacker in your system and it modifies your search results. Consequently, it could inject links that promote potentially unwanted programs, other browser hijackers, and adware. Under these circumstances, many users believe that they are downloading a useful application, because these types of software tend to exaggerate their benefits or promise non-existent features and tools, just like DietRunner. There is also another way for this application to spread as it may travel bundled with another program. If you download software from various file-sharing sites, you could have installed DietRunner when it appeared on another program’s setup wizard. Most of such applications are only suggestions and users can always deselect it, still often they happen to be overlooked. Sometimes it happens because instead of choosing advanced settings on installation wizard, users go with the automatic option. In this case, the suggestions could be hidden from the user, and while you are installing one piece of software, you get another program. If you want to keep your computer clean and secure, you should be more attentive and do not permit any suspicious applications to be installed. As we mentioned before, the software provides users with third-party advertising and because of that it was classified as an adware application. Apparently, the content it displays is not region specific. It means that all the users no matter their location should see the same ads. The main program’s window loads a website that could be reached with the given link via webmd.com/drugs/index-drugs.aspx. 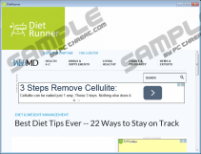 Although the site is somewhat related to health, it displays a lot of suspicious ads. It is hard to say which one of them could lead you to a harmful web page, so to avoid it you should not click any ads shown by DietRunner. Moreover, this adware application will load doubtful websites that display ads, coupons, surveys, and other offers. It seems these sites could appear in your default browser as the program manages to open new browser windows without your consent. As you realize, the ads displayed by this application will show up regularly and the only way to get rid of them and protect your computer is to delete it right away. This adware creates a lot of folders with its files in the %ALLUSERSPROFILE%, %APPDATA%, %PROGRAMFILES%, and other directories. In addition, it should add a few registry entries in different keys. Although you could erase DietRunner if you delete all the folders, files, and registry entries it created, it is simpler to get rid of it through Control Panel. Our researchers reassure us that afterward there should be no leftovers on your system. For this manual option, we prepared instructions that are available just a little below the text. Of course, you could also remove the adware automatically, if you install a reliable security tool. Once the antimalware tool you downloaded is installed, launch it and locate the adware with the system’s scan option. After the threat is located, you should be able to delete it at once. Press Win+R, type Control Panel and click OK.
Mark the adware and click Uninstall. Select DietRunner and click Uninstall. Open Start and select Control Panel. Pick Add or Remove Programs. Click the application and select Uninstall. Quick & tested solution for DietRunner removal.